Education: Years compulsory--to age 16. Literacy�98% (2003 est.). Work force (19.2 million): Services�65.1%; agriculture�5.2%; construction�12.5%; industry�17.2% (2005 est.). 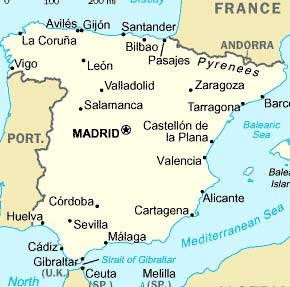 Spain�s Iberian Peninsula has been settled for millennia. In fact, some of Europe's most impressive Paleolithic cultural sites are located in Spain, including the famous caves at Altamira that contain spectacular paintings dating from about 15,000 to 25,000 years ago. The Basques, Europe�s oldest surviving group, are also the first identifiable people of the peninsula. Beginning in the ninth century BC, Phoenicians, Greeks, Carthaginians, and Celts entered the Iberian Peninsula. The Romans followed in the second century BC and laid the groundwork for Spain's present language, religion, and laws. Although the Visigoths arrived in the fifth century AD, the last Roman strongholds along the southern coast did not fall until the seventh century AD. In 711, North African Moors sailed across the straits, swept into Andalusia, and within a few years, pushed the Visigoths up the peninsula to the Cantabrian Mountains. The Reconquest�efforts to drive out the Moors�lasted until 1492. By 1512, the unification of present-day Spain was complete. Despite the success of economic liberalization, Spain remained the most closed economy in Western Europe�judged by the small measure of foreign trade to economic activity�and the pace of reform slackened during the 1960s as the state remained committed to "guiding" the economy. Nevertheless, in the 1960s and 1970s, Spain was transformed into a modern industrial economy with a thriving tourism sector. Its economic expansion led to improved income distribution and helped develop a large middle class. Social changes brought about by economic prosperity and the inflow of new ideas helped set the stage for Spain's transition to democracy during the latter half of the 1970s. In a June 2000 communiqu� following the explosions of two small devices in Barcelona, GRAPO claimed responsibility for several terrorist attacks throughout Spain during the past year. These attacks included two failed armored car robberies, one in which two security officers died, and four bombings of political party offices during the 1999/2000 election campaign. In 2002 and 2003, Spanish and French authorities were successful in hampering the organization�s activities through sweeping arrests, including some of the group�s leadership. Spain also continues to focus attention on North Africa, especially on Morocco. This concern is dictated by geographic proximity and long historical contacts, as well as by the two Spanish enclave cities of Ceuta and Melilla on the northern coast of Africa. While Spain's departure from its former colony of Western Sahara ended direct Spanish participation in Morocco, it maintains an interest in the peaceful resolution of the conflict brought about there by decolonization. These issues were highlighted by a crisis in 2002, when Spanish forces evicted a small contingent of Moroccans from a tiny islet off Morocco�s coast following that nation�s attempt to assert sovereignty over the island. In relations with the Arab world, Spain has sought to promote European-Mediterranean dialogue. Spain strongly supports the EU�s "Barcelona Process" which seeks to expand dialogue and trade between Europe and the nations of North Africa and the Middle East, including Israel. The latest meeting on this initiative was held in Barcelona on November 29, 2005.